He has over 20 years of experience in the investment management industry. Prior to Bajaj Allianz, he was fund manager at Principal Mutual Fund. He has also worked as equity research analyst with HSBC Securities and ABN Amro Asia Equities during his long innings in the industry. Currently, we are positive on the short to medium term part of the yield curve. Even though Nifty50 closed on a flat note, smallcap/midcap stocks registered significant corrections during the year. Despite the market volatility, India was a relative outperformer globally in 2018, as some markets registered deep corrections during the year. Debt market suffered a setback and saw a credit squeeze, due to default of one of the large infrastructure lenders. If one were to look at how the market closed the year gone by, it would appear to be an uneventful year, as market returns (as indicated by benchmark Nifty 50 index) were flattish. Even for the debt market, the 10-year benchmark bond yield closed on a flat note, with bond funds delivering subdued returns. In reality, it was a volatile year, when both equity and debt markets had rollercoaster ride. Even though Nifty50 closed on a flat note, smallcap/midcap stocks registered significant corrections during the year. Market breadth was largely negative. Even in the largecap space, it was a narrow market — with only a handful of stocks contributing most of the returns of the benchmark Nifty50 index – led by IT, select private financials and consumer companies. 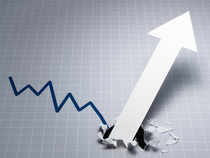 The debt market suffered a setback and saw a credit squeeze, due to default of one of the large infrastructure lenders. The benchmark 10-year bond yield rose from 7.3 per cent at the start of the year to peak at around 8.2 per cent in September 2018, and then fell sharply to close the year near the 7.3 per cent mark, as the interest rate and credit environment improved. Crude oil prices fall sharply: One of the biggest headwinds for the Indian markets and economy was rising crude oil prices. India is a large net importer of oil, and oil imports account for around 80% of domestic oil demand and a significant portion of our trade deficit. Brent crude oil rose from $67 a barrel at the start of the year to above $85 a barrel in beginning of October 2018, and then fell sharply to around the $50-55 a barrel mark. The sharp fall in crude prices has been helped by easing sanctions on Iran, unwinding of long speculative positions, significant increase in crude production, particularly in the US, and expectation of some slowdown in global growth. This sharp fall in crude prices would help mitigate some earlier concerns of rising current account deficit (CAD), and also inflation to some extent. Rupee recovers from lifetime lows: The rupee had weakened from 64/USD mark at the start of the year to life time low of around 74.5/USD in October 2018, and has now recovered to around 70/USD currently. This has been on the back of sharp fall in crude oil prices, reversal in foreign outflows, and a general recovery in most emerging market currencies. Bond yields soften considerably, providing some relief to the debt markets: As mentioned before, bond yields have also fallen sharply from its peak of 8.2% to around the 7.3% mark presently. This has been on the back of recovering rupee, liquidity infusion by RBI through OMOs, falling inflation, the recent dovish stance by RBI, and increased market expectations of some monetary policy accommodation (as opposed to calibrated tightening earlier). Credit & liquidity crunch eases: The debt default by infrastructure financer IL&FS spooked the bond markets in Sep/Oct 2018, and also led to turbulence and dried up liquidity in the NBFC/HFC space. However, the credit and liquidity crunch has somewhat stabilised now, and as a result CP/CD yields have also eased from their recent highs. Foreign outflows see some reversal: After seeing large outflows in the past few months (due to global risk aversion and a weakening rupee), we have seen a reversal in the months of Nov – Dec 2018, with foreign portfolio investors registering net inflows both in the equity and debt markets. Meanwhile, domestic flows into the equity markets continue to be robust and have countered the FII outflows this year. Valuations have become more reasonable: After the recent correction, valuations (P/E) have become more reasonable in the large cap space. Select stocks in in the midcap/smallcap segments also look attractive. Corporate earnings have been on a recovery path, although slightly below expectations. We believe that corporate earnings growth will accelerate in H2 of FY19 and particularly in FY20, and this should be the key driver for markets in 2019. Earnings growth over the past years was primarily driven by domestic consumption sectors; but we expect that growth will be more broad-based in 2019. We also feel that the capex cycle (which has been the drag earlier) has now bottomed out. The capex recovery will be more gradual and is likely to pick up pace post the general elections. From a sector perspective, we continue to like well-run private sector banks and NBFCs due to their good asset quality and healthy credit growth. We think that pharma sector, which was struggling due to the US FDA issues and weak pricing for generics, seems to have bottomed out. Also, we are incrementally turning positive on capital goods, on expectations of a capex turnaround--as the industry capacity utilization levels are inching towards optimal. In the equity markets, we have been preferring the largecap segment since the beginning of 2018, on a relative valuation basis. Although we still like the largecap segment; with the recent correction in the smallcap and midcap segment, there are some good selective bottom-up opportunities also emerging in this space. Investors should continue to invest in a staggered manner in equities, and could look to add positions on sharp market dips. The recovery in corporate earnings and economic growth in India should augur well for equities in the long term, however, one needs to be cognizant about the short-term volatility in equity markets. Historical data shows that longer the holding period for equities, lower the volatility and lower the chances of negative returns. Besides that, equity has been among the top performing asset classes over the longer term — helping to effectively beat inflation and create wealth for investors. So, investors should not get overtly influenced by the short-term market movements — and focus more in achieving their long-term investment goals. In the fixed income markets, with bond yields coming down substantially, we feel a large part of the rally is behind us now. We expect the debt markets to be range-bound--providing steady returns. Despite the headwinds mentioned earlier stabilizing, there are certain factors to watch out for, which may cause some intermittent volatility in 2019. On top is the recent turbulence in global markets, on fears of a global growth slowdown. Another factor to note is global monetary policy (particularly Fed), and although US monetary policy has turned slightly dovish recently, any pick-up in pace of monetary tightening by other major central banks may cause some volatility in emerging markets (including India). The forthcoming general elections in 2019 may also cause some volatility and uncertainty, but we expect it to be more short-term in nature. There may be some minor fiscal slippage due to some populist measures (which is usually seen ahead of elections), and lower than budgeted GST collections, but we do not expect a major impact of the same in the long term. Last, but not least, the trade tensions between US & China have stabilised, with US halting further tariffs for 90 days, to allow for talks. Remember, good things come to those who wait. So, patience and discipline (sticking to asset allocation) are the virtues of prudent investing. Happy New Year, and happy investing!